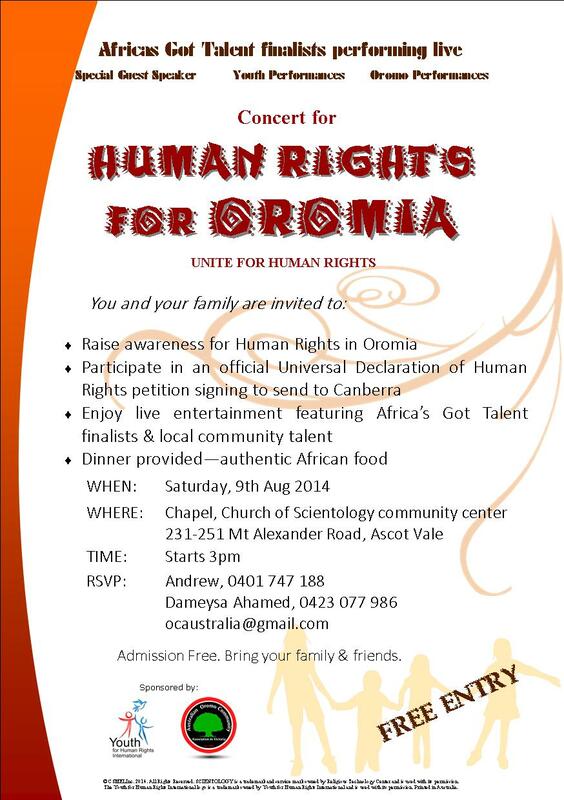 (A4O, 19 July 2014) The Australian Oromo community is pleased to invite you to the ‘Oromo Human Right Awareness Night’ scheduled from 4pm-8pm, 9th of August 2014 at Church of Scientology, 251-255 Mt Alexandria Rd, Ascotvale, 3032. According to the press release, the purpose of this event is to promote the awareness of gross human right violations occurring in Ethiopia, particularly in Oromia state. “We anticipate this event has the potentiality to enable us seeking support from politicians, communities and organisations so as to continue our campaign for respect of human right, freedom of people and democracy in the region,” says the press release. Book this date in your calendar and email this to your networks who would love to see the Africa’s got talent artists, Oromo food, Youth hip hop dancers and much more! You can also learn what you can do to stop the Oromo people from being pushed out of Oromia! FREE entry. All are welcome!!! Book the date in your calendar! 4:30pm, Sat 9th August. Posted on July 19, 2014, in Uncategorized. Bookmark the permalink. 2 Comments.